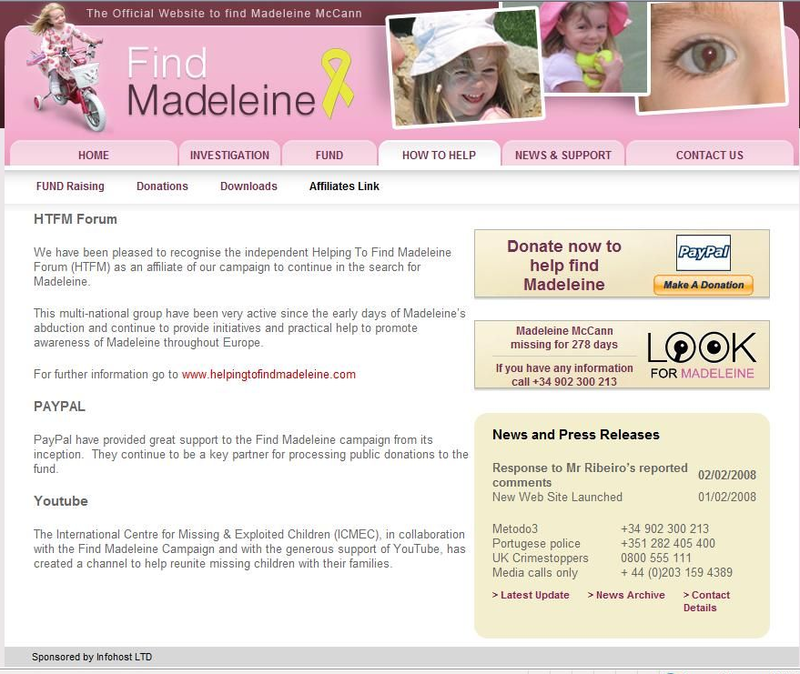 Using the acknowledged expertise of forum researchers and analysts, is there any positive indication that the official Find Madeleine Fund could be fraudulant? I don't refer to the more obvious anomalies, like transparency and accountability but more towards the legality of it's management, administration and operational activity as a limited company. In my own view, I think I've said many times on the open forum, the likelihood of 'the fund' being the McCanns downfall, is remote in the extreme. They are and always have been cosseted by expensive renowned lawyers. Chances of the fund administrators and legal advisors leaving themselves open to a fraud investigation, hovers around zero methinks - albeit only borderline legal. I don't doubt that's the true reason why charity status was dismissed in favour of a limited company - ostensibly there are strict codes that govern a charity whereas the management of a limited company is largely governed by the board of directors. Providing they don't break the law, they are safe from prosecution for malpractice - short of provable tax evasion or such like it's plain sailing. I've no connection with the police or civil/criminal investigation of any description yet, I believe the only possible criminal proceedings against the McCanns within the UK can be for malpractice within the Fund's administration, if it can be proven. The fund is a massive fraud on a grand scale, all that's needed is proof the McCanns knew MBM was dead at the time they asked for donations. It would be up to the UK to prosecute them I think, not Portugal. With everything this pair have done, to prove the fund monies were used fraudulently I expect Forensic Accountants would have to sort that mess out. It is my opinion the fund is used for money laundering, I have np proof of that, just my gut feeling. Ah yes, I see that clearly! Problem is proving the McCanns knew Madeleine was no more when sending out the begging bowls. With the scale of the establishment cover-up, I can't see that ever happening. Even if Portugal re-investigated the case as a result of the MMRG missive, I don't doubt the hole will be plugged before any water is allowed through. I was wondering if there was any other known aspect of the fund's administration that could be considered fraudulent - like the McCanns, family members and friends being on the board of directors. I understand, no way could anything directly relating to the fund be investigated by Portuguese authorities. I agree, I too think the fund has been used to launder money. Massive payouts to Oakley International and Bell Pottinger by way of example. Sharon might be able to enlighten us more on the points you have raised Verdi. I was hoping that my mother could have taken a close look at what is available, she was an accountant but she was never well enough to concentrate. Maybe Esther McVey got out of there in a hurry for other reasons than what the press reported? Then we had the accountants resign, so maybe there is something that isn't quite right & they exited PDQ? I'll wait for Sharon to look in, or anyone else who might have something to offer. As the forum is titled 'Fraud Investigation' I wondered if the subject had been covered already. I don't believe in the concept of 'the perfect crime' but I do believe in the possibility of 'the perfect cover-up' . In this respect I think the McCanns are bullet proof. It's customary with the establishment, if someone in a conspiracy gets a bit twitchy or too vocal, they are dealt with accordingly - like they disappear or are found dead. I believe the case is that serious. "I believe the case is that serious." I agree Verdi. Either the McC's have something huge on somebody/persons very high up or somebody high up did something very serious to Madeleine. We have very limited information to go on in the accounts and we have to rely upon the auditors report. The way to prove fraudulent activity in a company would be look closely at the underlying records, for example, detailed invoices from the private investigators etc. Unfortunately we will never get to see these. But, this is something that the auditors should have addressed. They should also have made sure that the company was meeting its objectives i.e "searching for Madeleine" as stated in the directors report and as publicly claimed elsewhere. If the auditors were not satisfied that the accounts show a true and fair view, they should state this in their report. This may be one of the reasons that the auditor would resign. If the directors have knowingly misled the public and received donations by false pretences, then the fund is obviously fraudulent. It was also stated in the accounts that Madeleine was abducted. If Madeleine did die in the apartment and her parents were aware this, then this is clearly a false statement made in the accounts by the directors. But why have the directors asked for an audit of this company? Why go to the expense when there is no need? Is it merely to add credibility to the accounts? If the McCanns were ever brought to justice over Madeleine and it was proven that they were well aware of her demise, the issue of a fraudulent fund would be a crime committed in the UK. Given the level of Government support that they are receiving, I doubt very much that they would be prosecuted over here. So as I thought, as far as CMoMM is concerned - no way forward. If anyone feels like splashing out 20 quid you can buy it ! Most are done online now and available immediately. If they were sent by post, they should have reached Companies House by 31st December and we would have a notice, in red, saying that they had been received and would be available soon. Last year, the deadline for filing mysteriously changed from Dec 31 to March 31, this is something that is not readily available to other companies, so why the McCanns? I received this notification from companies house yesterday..
Back in April 2015 you requested that we monitor MADELEINE'S FUND: LEAVING NO STONE UNTURNED LIMITED for any important changes. They have the cheek to appeal to the public for donations to their supposedly diminishing funds but then incur penalties because they cannot be bothered to file their accounts on time. Maybe they can't find an auditor prepared to cook the books ! Did HaysMacintyre ever give a reason for dumping the "Fund" without preparing final accounts ? Did Esther McVey (lifetime bosom buddy of KM) ever give a reason for bailing out so soon after being appointed as a Director ? Had they both had a chance to look closely at the books ? "Donations can still be made...."
Best of both worlds - they don't have to worry about buying in supplies to send you to help with their non-existent search but they still want your money anyway. It's an utter disgrace - how bloody dare they continue to beg when the evidence is stacked against their innocence? How bloody dare they beg for money to finance a hoax - and in the name of little Madeleine who is no longer in this world..
How bloody dare they - it makes my blood boil. They're in too deep, far to deep. The pretence has to be maintained at all costs and it is costing them, or should I say the tax payers and the public. What they need is to ! By their own admission they are no longer using private means to search, they said so when the Operation Grange 'investigation' was launched - nothing has changed in that direction. Thinking further, they have never genuinely searched for Madeleine, it's a big scam - a tall tale - a faked abduction. Now why might that be.. Believe it our not, there are occasions where Kate has told the truth even it it has been hidden in her comments. SharonL "Believe it our not, there are occasions where Kate has told the truth even it it has been hidden in her comments"
I know more than you do. I know what happened. I was there. Press a button and we’d all be together.
" Did they really believe that a dog could smell the odour of death three months later from a body that had been so swiftly removed ? I want to shout it from the rooftops . Go on Kate , shout it , we are listening for Madeleines sake . I've just received this email from Companies House. The document can be purchased from Companies House if anyone fancies splashing out a fiver. I don't! Or you can view and print off all the pages from the Companies House website under 06248215.